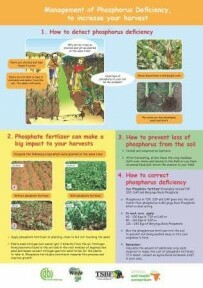 Management of phosphorus deficiency (smallholders) - a farmer-friendly poster explaining how to identify, prevent and treat phosphorus deficiency in soil. Farming in a changing climate with ISFM. Produced by Young African Express to support the Smart Farming campaign - 3 x pages A4 paper to inspire young students about agriculture. Commissioned by ASHC as part of its youth innovative communications pilot.